The winner of Devereux Advanced Behavioral Health’s 2018 Weaver E. Falberg Leadership Promise Fellowship award is Amy White. White is a payroll and finance specialist at Devereux Georgia. Pictured here: (Left) Devereux Georgia Executive Director Gwen Skinner, Devereux President and CEO Carl E. Clark II, Amy White, Devereux Chairman of the Board Christopher D. Butler. 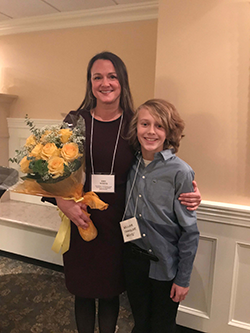 White will receive a $30,000 fellowship to pursue a bachelor’s degree in business administration from Brenau University in Gainesville, Ga. Pictured here: Amy White and her 11-year-old son, Chandler. The winner of Devereux Advanced Behavioral Health’s 2018 Weaver E. Falberg Leadership Promise Fellowship award is Amy White, payroll and finance specialist at Devereux Georgia. White will receive a $30,000 fellowship to pursue a bachelor’s degree in business administration from Brenau University in Gainesville, Ga. She was presented with the prestigious award on November 16 during a dinner with Devereux’s Board of Trustees, members of Devereux’s senior leadership team and the Pennsylvania Advisory Board, and other Devereux friends and supporters. White joined Devereux Georgia in 2013 as a file clerk and was quickly promoted to case manager within the organization’s Therapeutic Foster Care program. In 2015, she decided to change career paths and joined Devereux Georgia’s Finance Department as a finance support specialist. She was promoted to her current position in 2017. Two runners-up also were presented with fellowship awards during the special dinner. Amy Doles, program manager at Devereux Florida, will receive a $20,000 fellowship to pursue a master’s degree in applied behavior analysis online at Capella University. 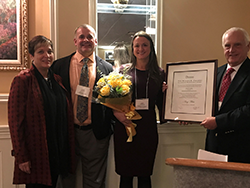 Jessica Lyles, revenue quality system manager at Devereux Corporate, will receive a $10,000 fellowship to finish earning her Master of Business Administration degree with a concentration in healthcare administration from Eastern University in St. Davids, Pa. The Weaver E. Falberg Leadership Promise Fellowship award was established in 1989 by Devereux’s Board of Trustees. It honors the memory of Weaver E. Falberg, who served as board chairman from 1983 to 1991. The award recognizes an employee’s commitment to our organization’s mission, along with his or her outstanding leadership capability and potential. Award recipients receive financial assistance for the purpose of furthering his or her education and training, and to assist in strengthening leadership capabilities. Fellowship funds are used for degree completion, certificate programs and executive or leadership development programs.